ToyArk.com has just received updated G.I. Joe Modern Era revision case images. If you missed Battlefield Cobra Commander, Beach Head, Duke, Scarlett, Destro, Roadblock, Gung-Ho, Crimson Guard, FireFly, Flint, IG Destro, Stalker, Snake Eyes, Storm Shadow, H.I.S.S. 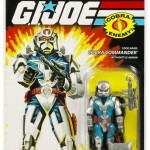 Tank Driver, Snow Job or Cobra Viper’s you will now have a second chance to add these to your collection.